Description: Aileen Guilding was Professor of Biblical History and Literature in the University of Sheffield from 1959 to 1965, and was known especially for her monograph The Fourth Gospel and Jewish Worship: A Study of the Relation of St. John's Gospel to the Ancient Jewish Lectionary System (Oxford, 1960), which enjoyed a succ�s d�estime in its day as an exceptionally fascinating and learned book. She is celebrated in Sheffield as the first female professor in the University; she was also the first woman to hold a chair in theology or religion in the United Kingdom. After her death at the age of 94 a conference on themes relevant to her special interests was held in Sheffield as part of a meeting of the Society for Old Testament Study, and the papers read there are presented in this volume, published in the 101st year after her birth. Citation: Benjamin J. M. Johnson, review of David J. 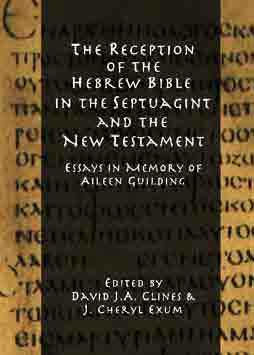 A. Clines and J. Cheryl Exum, eds., The Reception of the Hebrew Bible in the Septuagint and the New Testament: Essays in Memory of Aileen Guilding, Review of Biblical Literature [http://www.bookreviews.org] (2014).